(sale Sotheby's London, 7 December 1978, no. 114); Adolphe Stein Gallery, Paris; purchased by NGA. Splendori del Settecento Veneziano, Gallerie dell'Accademia, Venice, 1995, 418, no. 134 (repro. p. 418)(entry by Annalisa Prissa Torrini). Building a Collection, National Gallery of Art, Washington, 1997-1998, no. 51. The Poetry of Light - La poesia della luce: Venetian Drawings from the National Gallery of Art, Museo Correr, Venice, Venice, 2014 - 2015, no. 62. G.B. Piazzetta: Disegni-Incisioni-Libri Manoscritti. Exh. cat. Neri Pozza, Venice, 1983: 40. 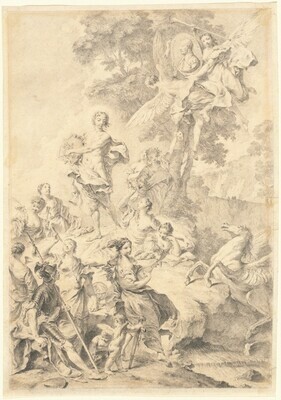 Piazzetta, A Tercentenary Exhibition of Drawings, Prints, and Books. Exh. cat. National Gallery of Art, Washington, 1983: 166-167, no. 74. Splendori del Settecento Veneziano. Exh. cat. Electa, Milan, 1995: 417-418.